For most classwork, the end result is knowledge banked for the future. 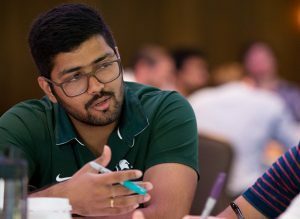 But for Eli Broad College of Business Full-Time MBA students, their latest lessons were being put to use by one of the world’s titans of industry just as they were being learned. 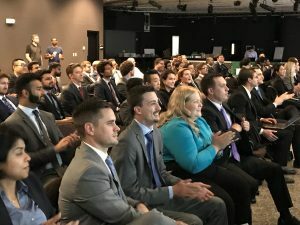 The creation of a go-to-market strategy for an actual, new business opportunity for Big Three automaker General Motors was the outcome of the most recent chapter of “Extreme Green,” an experiential case competition series that took place in late August. 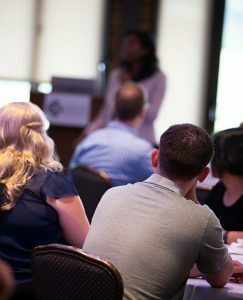 “Our promise to every student, regardless of their functional expertise, was to provide a unique, real-world experience to help them build their confidence, competence, and credibility in open innovation practices,” said Shana Redd, a Broad College professor of practice in the Department of Management who helped lead the immersive learning event. “We believe we delivered on this promise by developing a challenging and industry-agnostic business opportunity, training on a process that stimulates creativity, supplying tools to build an actionable business model, and with the support of GM’s leadership team, providing an audience of experienced professionals from whom our students received feedback and guidance,” Redd said. 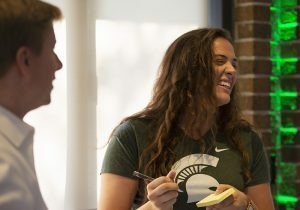 During the two-year MBA program, each student participates in four Extreme Green competitions, themed on confidence, problem-solving, innovation, and entrepreneurship. This competition was the third of those four. The particulars of the winning idea are a secret, as it will be used in a real-world, competitive situation. 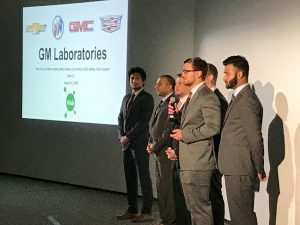 Winning pitches were selected Friday, Aug. 24, by GM officials at the GM Tech Center in suburban Detroit, after the teams spent the preceding two days developing their concepts. “This has ignited new conversations which will help GM and iHub make future decisions about how to generate revenue and prove the value of innovation,” Ehaab said. “I am impressed with the extraordinarily high level of engagement and intellectual rigor displayed during this event,” Redd said. The MBAs utilized skills taught at Broad College and imported from GM. “We showed them how we, at iHub, use ‘the iHub Way’ to tackle problems,” which combine human-centered methods and design principles “to go from understanding pain points to creating a business case and pitching it to decision-making senior leaders,” Ehaab said. First place: Eric Preston, Vivek Sidagam, Robby Multani, Krish Mehta, Evan Annis, Andrew Hoefer. Second place: Sean Creighton, Kelly Huston, Mitchell Owens, Hysen Parampil, Lizzy Kennedy, Mohit Bhake. Third place: Dustin Reid, Joseph Holmes, Jason Siegfried, Prikshit Ravesh, Kartik Gupta, Anirudh Gupta. Members of the first-place team won $850 per person. Runner-up team members got $400 each, and members of the third-place team each earned $250. The next installment of Extreme Green will launch in the spring of 2019, and it will be centered around entrepreneurship.